"All those of red blood and yellow skin. 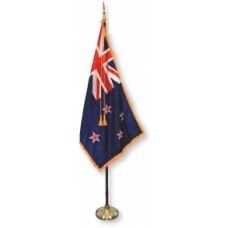 Together we fight under the nation's secured flag. 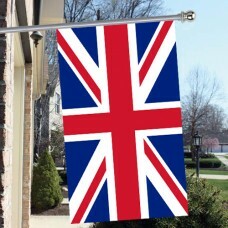 The flag is soaked with our crimson blood, shed for the nation. The yellow star is the color of our race's skin. Stand up, quickly! The nation's soul is calling for us intellectuals peasants, workers, traders and armymen united as a five-pointed yellow star." 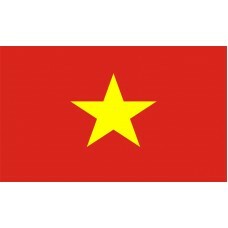 The Vietnam flag was officially adopted on September 5th, 1945. Vietnam is a country that is located in Southeast Asia and shares borders with China, Laos, Cambodia, Gulf of Thailand, Philippines, Malaysia, and Indonesia. The capital and second largest city in Vietnam is called Hanoi and the largest city is called Ho Chi Minh. 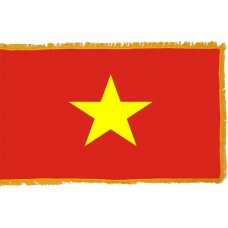 Vietnam is a country that had 1,000 years of independence before it came under the rule of China, Japan and France. In 1884, the whole country came under the rule of France and in 1887, it became part of French Indochina. The French maintained control and their colonies of Vietnam until WWII, when the Japanese invaded French Indochina in 1940. In 1941, leader Ho Chi Minh sought independence from the French and from Japanese occupation and declared independence on September 2nd, 1945, following Japan's military defeat. This led to the First Indochina War which began on December 19th, 1946 and ended on July 20th, 1954 when French Indochina was dissolved into three separate countries, which were Vietnam and the Kingdoms of Cambodia and Laos. At the same time, Vietnam was also divided into the North and South administrative regions. Vietnam's economy is largely based on the agriculture and manufacturing. Tourism also contributes to the economy with the number of tourists greatly increasing each year. It is home to many beautiful attractions with the main attraction being "Ha Long Bay" which translates as "Bay of Descending Dragons" and consists of thousands of islands and islets and limestone pillars. It is also home to the "Hang Son Doong" which is the world's largest cave and has its own river and jungle. Another main attraction is the "Imperial City" and the fortress and palace that was built in 1362 and took approximately 203 years to complete. The fortress represents Vietnam's wealth and its power as boars carried the materials to build the fortress. Arise and break these chains. Be ready for all sacrifices and life will be radiant.